After my threat of legal action, the Telegraph have agreed to pay me the full £180 for the unauthorised use of my photograph. I have spoken further to my editor and we will pay you the £180 you demand. This is out of goodwill but you must understand we obtained permission for this: the feminist society is where you should direct your issue to make sure it doesn't happen again. We simply would not have used your image if we'd have known we did not have permission. I hope you understand this was a genuine mistake. I understand you attempted to obtain permission, but I do not think it is right that you assume a third party is legally permitted to give permission for someone else's work to be used. In future you should be ascertaining if a licensing agreement has been made between the copyright holder and the third party. Ok - but the 'third party' in question is the university of which you are a member. No, Louisa. I am a graduate of the University of Bristol, which is not affiliated with the Feminist Society. FemSoc is affiliated with the University of Bristol Students' Union, which I am not a member of. I emailed her back to let her know. I just thought I'd make a final update so I have a record of what's happened with regards to the Telegraph's unauthorised use of my photograph. As of right now, the image is still on the article. I have not formally requested it to be taken down, but I have heard of cases where rightsholders have attempted to deal with unauthorised use of an image and the image was simply removed, as if this solves the issue of it having been used in the first place. So, the image is still up and I still haven't been paid. To clarify, I expect the invoice of £180 to be paid in full by 04/02/2014, 30 days after I originally sent the invoice to you. Should the amount still be unpaid after this date, I will make a court claim in Bristol to recover the money. If there are any issues, I would like to correspond with your picture editor. So now I'll just sit tight and wait until February. If they haven't paid up by then, I will make a claim for the outstanding money. The Telegraph may say they do not owe me anything as they got permission from the Feminist Society, but I maintain that this permission was not authorised. I won't be updating in the meantime if I do begin negotiations with the picture editor, or anyone else at the Telegraph, unless something really ridiculous happens...but I'll let you all know how it goes if I am successful in asserting that I have the right to be paid a reasonable amount for the use of my work. The real issue that I would like to see solved is the apparent complacency of editors when sourcing images for articles. There are other tales of publications not acquiring permission to use someone's work prior to publishing it. This is wrong. It is also wrong that the Telegraph assumed a third party was licensed to distribute my content, without any proof whatsoever. They were given my name and a link to my Flickr page, but did not think it appropriate to get proof that I licensed the Feminist Society to distribute my work, or contact me before using it. I also used the figure for a 300x400px photo being used online for one month. In reality, this picture would probably have stayed online for longer than that. I'll conclude this post by saying rightsholders need to be respected. A photograph is a piece of work governed by copyright laws - these imply that the work has intrinsic value and also prevent content creators from being exploited. Always contact the photographer before using an image that is all rights reserved. If you find your content has been used without your permission, get in touch with the infringer and let them know they should have contacted you first. As an example, I personally wouldn't dream of charging a non-profit student society for using my work on their website, provided it was attributed to me and linked back to my Flickr page. However, when a national newspaper publishes my work without paying for it, I will complain, and I will get this sorted out. I'm back in Bristol now and was able to keep up the correspondence while I was on the train. Massive thanks to Jamie, a fellow photographer, for the advice and support. Read up on the background of the Telegraph using my photo without my permission. We assumed you were happy with your photos to be used with reference to the Bust a Myth campaign, as well as that the Telegraph would double-check. We now realise that we were absolutely in the wrong to do so, and on behalf of the society I'd like to apologise unreservedly. Note: they had the photos because someone (who I was unaware was affiliated with FemSoc) wanted to use a photo in a not-for-profit feminist journal. I never actually sent this guy any copies of the photos, assuming he would ask me for copies of the ones he wanted to use as they were not freely available anywhere (besides being viewable on Flickr, with anti-download protection turned on, as discussed previously), so this is all a bit of a mess. Me giving permission for the use of a photo in a single journal certainly does not constitute blanket permission to redistribute my photographs, so FemSoc are definitely in the wrong in that sense. I have had a response from the secretary of the Feminist Society stating that they passed my details on to Emma in the belief she would check with me before publishing the photograph, and they accept they had no right to give her permission to use the photo. The fact is, you have published my photograph without my permission. What you have assumed is permission is not legally admissible, as the party who provided you with it had no rights to the works in question. You did not see any documentation indicating that I, as the copyright holder, licensed the Feminist Society to distribute my work in this way, so an error has been made. I expect the Telegraph to fully honour the original invoice I sent to you. You can see from the email that the Society sent us that there was absolutely no indication that we should check with you; they gave us full permission. They may be changing their story now but that's not what happened at the time. Plenty of organisations work on behalf of photographers and offer credit on their behalf, this is not unusual. However I can see on this occasion a human error has been made - these things do happen. Our standard picture rate for photos is £25 inc VAT for online usage, which this was. So if you want to resend an invoice for £25 I can get that processed for you as a matter of goodwill. I am unsure that FemSoc are "changing their story"; I think they honestly thought that giving the Telegraph my details would result in the journalist contacting me - however there is the fact that Florence from FemSoc stated she was giving the Telegraph permission to use the photographs. While I can see that the Telegraph may have given them the benefit of the doubt and assumed FemSoc commissioned me to take the photographs on the basis of Florence's email, that was absolutely not the case and they did not acquire any proof that I had licensed the photographs for FemSoc's use and distribution. Therefore, the Telegraph are entirely culpable for the publication of an image which they did not have the correct permissions for. I don't think third party licensing of content being common in the media industry is a defence - the Telegraph had no written evidence, for example a licensing agreement, that FemSoc were authorised to give my photos to them. But we don't pay anyone that amount for online photos. I'm afraid our offer is £25. I mean, that's great that you have set rates outlined, but this was not a normal business transaction. My work was used illegally, so the Telegraph can't really act like they acquired permission in the first place and offer me a standard sum. So...I've threatened legal action. I believe the Telegraph did not do everything necessary to acquire permission for the use of my copyrighted work. They had my full name and a link to my Flickr account, so contacting me would have been easy. Therefore, they're culpable. I've submitted an application for student membership of the NUJ and I've emailed them a copy of my correspondence with Louisa in order to see if they can assist me with this. I'm hoping this can be resolved without a court case, but I'm willing to go ahead and deal with it that way if the Telegraph won't pay my invoice. Jamie has also advised me to get in touch with the BJP, which I may well do. Although Florence did correspond with Emma Pearce via her personal account, the email in which permission was given to publish your photographs was drafted by the FemSoc committee as a whole. We, as a body, apologise for having made that crucial error. Our intentions were in no way malicious, only careless. We hope this statement helps you in your discussions with The Telegraph (I'm about to send an email to Emma so she has our statement as a society), although if they need something specifically from Florence she can absolutely provide this. Another update on the Telegraph using my photo without permission. Let me know what she says and whether you can get this resolved through them. Seeing as they gave us full permission in writing you need to speak to them first. I would like to reiterate that I am not affiliated with the Feminist Society and did not license my photographs to them, so they have no legal right to give you permission to use my work, whether in writing or otherwise. Nevertheless, I've contacted Florence from FemSoc to find out how she got hold of my photos, and why she thought she could give permission for them to be published online. So I'll email the Telegraph again once I've heard something from her...or once my nerves get the best of me. It's really not fun suffering from anxiety and having to deal with something like this. Maybe I'll blog about that in future, who knows. Right, I'm on trains today to get back to Bristol to hand in my coursework, so I'll be off now. Hopefully I'll hear something from FemSoc this evening! Just thought I'd update you all on what happened with the whole Telegraph situation. She gave me her editor's email address and told me to contact her regarding my issue. So I copied the email I sent to the general Telegraph letters page and sent it over to Louisa Peacock, who replied pretty swiftly, on a Sunday as well, so many thanks for that! 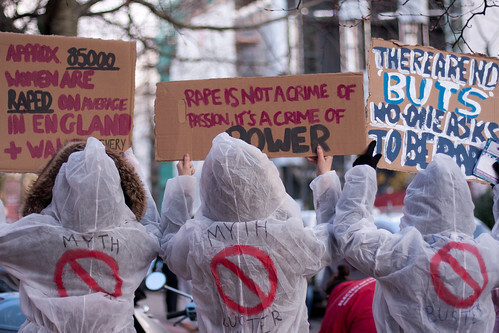 "I have attached some photographs from the Bust A Myth campaign spoken about earlier. The Bristol University Feminist Society give the Daily Telegraph permission to publish these photographs. "Rajitha Ratnam took the pictures, and her Flickr id is missionverdana." So Emma is very surprised that you are saying we did not have permission - as she sought permission and believed she got it from the feminist society itself. Well, I was fairly stunned. I have no affiliation whatsoever with FemSoc. I have not spoken to anyone at FemSoc about my photos, let alone provided them with copies of the images. FemSoc have no right whatsoever to give permission for my copyrighted work to be used anywhere. These photos were taken for my own personal use: a coursework assignment for the University of the West of England. It is my right to decide who can use these images and whether I require payment for them doing so. This is a serious misunderstanding of copyright law. While I am sure Emma and Louisa acted in good faith and were assured they had permission to use a copyrighted image, the party providing them with this permission did not have the right to do so. I have contacted FemSoc via email to find out how they got hold of my photographs. While I am not naive enough to believe Flickr's anti-download feature, which I have turned on, will present determined users with any difficulties in acquiring photos, I'd like to know if this is where they got them from, or whether someone else altogether acquired my photos and passed them on to FemSoc. Anyway, Louisa has said she will get back to me tomorrow afternoon after seeking advice on how to proceed, so I hope this will get resolved soon. Now, back to coursework. Edited to add: Just want to make it clear that I do expect the Telegraph to compensate me for the use of my work - they never got permission from me to use it, so their use of it was unauthorised. Also, I've finished my essay! ETA2: Fixed some typos...wrote this in a rush and didn't check it over earlier. ETA3: Just to clarify, turning on the anti-download feature on Flickr was not a result of this - I have had it turned on for years. Today a friend told me one of my photos was up on the Telegraph website. I was surpised, as I had never had any contact with the Telegraph regarding the use of any of my images. I checked out the article, and, yup, it was one of the photos I took at the UBU Bust a Myth event in November. While I appreciate that you have given me credit for the image, I am disappointed that you published the image without first contacting me to ask permission and without paying me for use of my work. Below is my invoice for the use of 1 image to which I own the copyright. The rate is as recommended by the National Union of Journalists. I have no idea where they got the image from. As far as I know, it is only online on Flickr and is clearly marked "All Rights Reserved". Even though I'm not a famous photographer or anything, I'd really like to get the word out that this sort of behaviour is unacceptable. Photography might be a hobby for me, but it's a career for many people, and if news outlets think it's ok to use students' photographs for free, that damages an entire industry of hard-working people.